We have added a greenhouse to our garden ventures to extend our growing season. It is 3.6 x 2.4m (12′ x 8′). 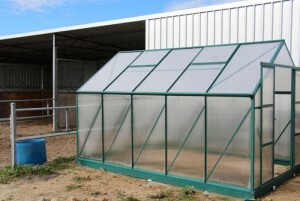 It has an aluminium frame with 6mm coreflute polycarbonate sheets and went together like a giant meccano set. I was impressed with the design of some of the key extrusions, particularly the gutter system which locked the whole frame together and held the sheets in place. The instructions said it would take 330 – 550 minutes, it probably took closer to 1500 minutes. There were over 500 nuts and bolts and many had to be slid into place on the struts before fixing them in. There was a bit of an error on the roof struts where we had to insert 6 or 7 bolts on each one. After fixing everything in place, there were 2 spares left on each strut. The gutter on one side feeds into Bowie’s water bowl – the other into a rain water barrel which will be used to water the plants.